A new report published yesterday at the ‘Grow Africa Investment Forum’ in Abuja, Nigeria, where the World Economic Forum is being held, shows investments in fledgling seed companies with local focus, could net big returns for African food production on small farms. According to the authors of the report – Alliance for a Green Revolution in Africa (AGRA), locally-owned African seed companies participating in a program to offer high-yield crop varieties to smallholder farmers across the continent, have collectively become the largest seed producers in sub-Saharan Africa. 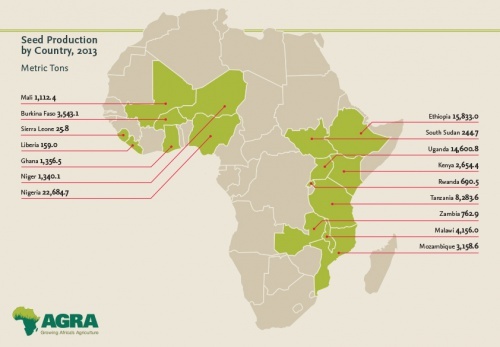 The report – ‘Planting the Seeds of a Green Revolution in Africa’ reveals 80 small and medium-size African seed companies in 16 countries that are on track to producing over 80,000 metric tons of professionally certified seeds in 2014. AGRA launched PASS in 2007 to inject new energy into Africa’s commercial seed sector, which was failing to provide African farmers with a steady supply of locally-adapted, improved crop varieties – something that farmers elsewhere in the world take for granted. The stagnant state of commercial seed production often is cited as a key reason why yields per hectare in Africa for staple crops like maize, are up to 80 percent below what farmers outside of Africa achieve. According to the report, PASS started out working with a handful of companies that together produced about 2,000 metric tons of seed. Today, seven years later, it is partnering with some 80 companies across the continent that produce professionally certified seed for an array of African staple crops including maize, cassava, millet, rice, sorghum, beans, sweet potato, cowpea, groundnut, soybean and pigeon pea. But it worked with PASS and other partners to rapidly expand, and now produce thousands of tons of seed each year for a wide menu of crop varieties, including high-yield sorghum, millet, and cowpea developed specifically for Nigeria’s growing conditions. “Nigeria has the potential to become one of the world’s great bread baskets, and giving our farmers access to certified seed for high-yield crop varieties is crucial to fulfilling that promise,” said Ibrahim Abdullahi, managing director of Maslaha Seeds. There are indications already that increasing access to the improved seed is helping farmers coax far more food out of the same amount of land. A 2013 survey of farmers in nine countries found that the majority of farmers who have invested in improved crop varieties, have seen yields rise by 50 to 100 percent. For example, 69 percent of farmers surveyed in Kenya, 74 percent in Nigeria, and 79 percent in Mozambique, said improved maize varieties had allowed them to double the amount of maize harvested per hectare. Meanwhile, 79 percent of farmers surveyed in Ghana reported doubling rice yields, and 85 percent of farmers surveyed in Uganda reported doubling yields from cowpea. The analysis of AGRA’s seed program notes that the following successes can be attributed to a strategy focused on addressing weak links across what agriculture experts call the seed “value chain” – particularly education, breeding, production, and distribution. • Publicly-funded crop breeding programs supported by AGRA since 2007 have released 464 new varieties of 15 important crop species developed for specific African climates and soils. Many breeders employed at a national level work collaboratively with international breeders from the CGIAR Consortium who provide breeding stock and, sometimes, finished varieties. Through public-private partnerships with seed companies, more than 300 of these new varieties already are available to farmers via local seed companies. 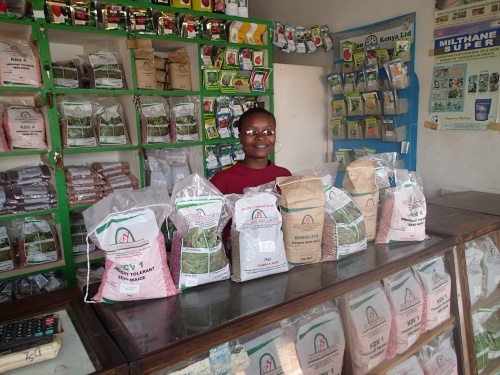 • To address the fact that many farmers in rural areas don’t have a shop nearby that sells seeds and fertilizers, AGRA has trained and certified more than 15,000 local small business owners to sell farm supplies. The report found that these modest businesses are having a big impact. 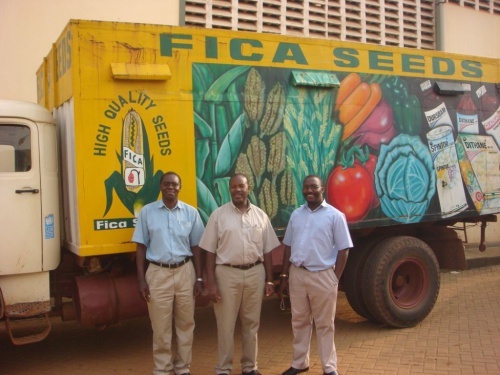 The “agro-dealers” supported by AGRA now provide smallholder farmers in 16 countries with 400,000 metric tons of seed and 1 million metric tons of fertilizers each year. Additionally, they have held around 7,000 technology demonstrations and 4,000 “farmer field days” where local growers can examine test plots planted with new crop varieties. • AGRA’s goal to train a new generation of African crop breeders has resulted in 66 scientists earning doctorate degrees and 135 earning master’s degrees by the end of 2013. The report also identified challenges to ensuring that the majority of smallholder farmers in Africa have access to improved crop varieties, as well as fertilizers and other inputs, required to achieve their full yield potential. For example, national governments need to free up the supply of foundation seed, developed by their public-sector breeding programs and offer tax incentives to encourage investments in processing equipment, irrigation technology, and other seed production infrastructure. Also, local seed companies need more access to investment capital, and farmers need to learn more about the benefits of investing in quality seed of superior varieties. Donor countries are increasingly viewing agriculture as the key to alleviating poverty in Africa. Major new initiatives are being launched, such as the New Alliance for Food Security, a shared commitment of African leaders, private sector partners, and donor governments to lift millions out of poverty over the next decade. As part of that initiative, AGRA, with support from ‘Feed the Future’ through the United States Agency for International Development (USAID), is accelerating the adoption of high-yield crop varieties and complementary technologies by smallholder farmers in Africa. This support is being channelled through the ‘Scaling Seeds and Technologies Partnership (SSTP)’, a $47 million effort in Ethiopia, Ghana, Malawi, Mozambique, Senegal and Tanzania. 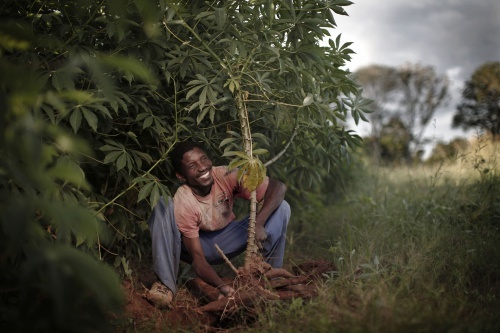 “It’s clear that increasing incomes for small farms, and for the local businesses that supply them, is the key to prosperity for millions of people living in sub-Saharan Africa,” said Dr. Richard B. Jones, SSTP Chief of Party at AGRA. The discussion at the World Economic Forum on Africa, of the benefits gained from investments in local seed production, occurs at a time when many people inside and outside of Africa see agriculture as the engine that can drive economic growth across the continent. For example, Akinwumi Adesina, Nigeria’s Minister of Agriculture and Rural Development, believes agriculture has the potential to become Nigeria’s “new oil”, and has embarked on an ambitious program to dramatically increase food production in Africa’s largest economy. At the same time, with the new activity around agriculture in Africa, comes concern that rapid growth could marginalize smallholder farmers and local agriculture business. Officials at AGRA insist that the focus has to stay on boosting production on smallholder farms, and nurturing local agriculture-related enterprises. “When we talk about a unique Green Revolution for Africa, we are talking about something that is indeed revolutionary, which is the development of a modern, highly productive agriculture sector that remains focused on small, family farms,” said AGRA President Jane Karuku.